Edutopia's new video series profiles young people who are pursuing their passions and making their learning more authentic by taking it into their own hands, on their own time. This series is produced by Mobile Digital Arts and Twin Cities Public Television, as a companion to an hour-long PBS special that is now available to watch. High school student Shayanna develops her talents at Youth Speaks, a nonprofit that creates a safe space for young people to explore writing and performance skills in the service of bettering their communities. 16-year-old Alexa gets hands-on experience and leadership skills by collaborating on a play space for kids through Philadelphia's Public Workshop, which promotes community engagement and civic innovation. Teens in Philadelphia learn how to solve math and engineering problems while working together to build high-efficiency homes designed for disaster relief, as part of an alternative senior year program called Sustainability Workshop. Building robots inspires such passion in high school seniors Violet and Kjersti that they've begun mentoring younger robotics teams to teach STEM skills -- and save their school's robotics program. 16-year-old Noah finds purpose and learns valuable career skills working at a nonprofit two full days a week, while protecting and restoring his local watershed. Internships with deep impact are a key element at his high school, San Diego Met, part of the Big Picture network. 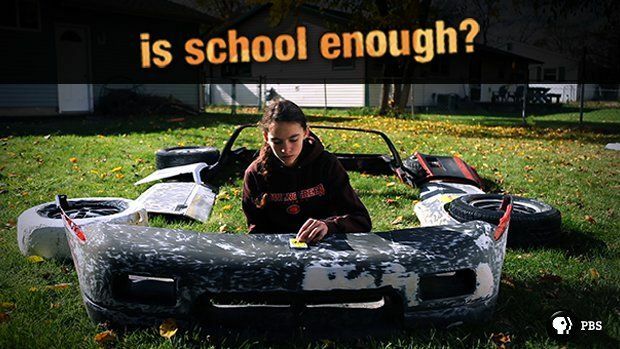 Math used to be a struggle for 14-year-old Kathryn, until she fell in love with cars and started a hands-on project to build her own. Now the math matters and makes sense, and a whole new world of learning has opened up for her. Texas 10-year-old Rhys uses Gamestar Mechanic to program and create worlds to play in, learning valuable skills in science, technology, engineering, and math along the way. Major funding for the PBS show and video series was provided by the MacArthur Foundation and the Pearson Foundation. Blogger Adam Provost visits the Fab Lab at NYC's Marymount School for a view from the front lines of the Maker movement. Social studies teacher and ed tech adjunct Matthew Farber outlines the basics of gamification and suggests how they can be used to engage students in a game-centric world. Blogger Suzie Boss explores the notion that adventuresome experiences that engage both mind and body are how we learn best. Teachers who love hands-on learning and the DIY movement are a match made in heaven -- and nowhere is this better represented than the Maker Faire. VideoAmy has curated this collection of videos to help you explore the event and the culture that has grown around it. Blogger Suzie Boss explains how making PBL part of out-of-school time gives youth new opportunities to become leaders, thinkers, and problem-solvers. Innovative thinker John Seely Brown, known for his ideas for merging digital culture and education, shares lessons educators can learn from surfers, gamers, and artists on how passion and competitive hunger can drive intrinsic motivation. University of Wisconsin game-based learning scholar Constance Steinkuehler talks about her research on online video games and literacy, and how learning skyrockets when students are passionate about the subject matter. University of Southern California media scholar Henry Jenkins describes how educators might fuel civic engagement by tapping the skills their students develop in interest-driven online communities. Documentary filmmaker Ramona Persaud shares a list of family activities that promote summer learning without taking the fun out of vacation time -- and they're good ideas for the whole year 'round! Media theorist Douglas Rushkoff encourages parents of tweens to let their children's social selves develop through reasonable limits on their digital access. Experts agree that parent involvement in their children's education is one of the biggest predictors of student success. As a parent, where do you begin? We've compiled a list of articles, videos, and other resources to help you engage in a productive way with your kids' teachers and school. Hive Learning Network is an organization focused on building digital media learning environments where youth can more easily participate in educational activities by pursuing their interests and following their peers. YOUmedia network is a group of libraries, museums and community-based organizations that invite young people to create, learn and build skills. DIY is an online community for kids to master new skills of all kinds, share what they create, and meet others with the same interests. Young Makers is a program that connects students with adult mentors to create opportunities for kids to dream up and develop projects for exhibitions. The Center for Informal Learning and Schools (CILS) is a consortium housed at San Francisco's Exploratorium with a mission of strengthening science education through research and leadership programs that broaden concepts of learning across formal and informal environments. Digital Media and Learning Central (DMLCentral) is a collaborative blog and curated collection of free and open resources on how digital technology is changing learning environments, social and civic institutions, and youth culture. Connected Learning is a website dedicated to a learning approach designed for the demands and opportunities of the digital age. Wonderopolis is an initiative from the National Center for Family Literacy and aims to be a place where parents nurture a brighter world for their children through discovery, creativity, learning, and imagination, sparked by daily emails offering topics for exploration. 826 National is the hub of a network of nonprofit writing and tutoring centers around the country with inventive programs that provide under-resourced students, ages 6-18, with opportunities to explore their creativity and improve their writing skills.